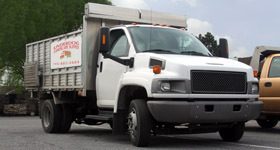 Underdog Landscape Supply offers both pickup and delivery for customers. Underdog Landscape Supply’s delivery service is dedicated to quality, speed, and convenience. All within a day, your mulch can be ordered, delivered, and ready to go with just a simple phone call to Underdog Landscape Supply. Our Customer Service Representatives can help you through whatever it is you need to be delivered. Schedule the delivery time and place at your convenience; no matter what the size, we offer delivery services for all products, all sizes, all day! Along with supplying quality landscape materials – staying dependable, convenient, and customer satisfaction is our top priority. To schedule your next landscape supply delivery with Underdog, contact us today! Visit us at: 701 Washington Street, Conshohocken, PA 19428.